Today is the first day of rehearsal for this spring’s extremely exciting double bill of La Voix Humaine and Suor Angelica! As I post this, Maestro Gary Thor Wedow is downstairs in our rehearsal studio with the cast, getting the tempos and musical entrances organized with all the nuns at Suor Angelica’s convent. Everyone at Seattle Opera was delighted to meet newcomer Maria Gavrilova, the Russian soprano who is singing Suor Angelica for us. This wonderful performer, well-known at the Met in New York and the Bolshoi in Moscow, is not only making her Seattle Opera debut, she’s making her role debut as Puccini’s loving, suffering nun. (Listen to Gavrilova sing an aria of Cio-Cio-San’s HERE.) If you’ve never before heard Suor Angelica, you’re in for a great treat. I’ve loved this ravishingly beautiful opera since I was a kid--I remember listening to an LP of Joan Sutherland singing it whenever I needed a little tenderness in my life—and I know Gavrilova’s performance will be overwhelming. Meanwhile, our costume shop is ready to fit Nuccia Focile, who sings “Elle” in La Voix Humaine, with a new costume, a dainty negligée designed for her by Melanie Taylor Burgess. Rosalind Plowright, who plays Suor Angelica’s aunt, was telling me that she and Focile were on the same plane from London to Seattle the other day--and that as they were landing at Seatac airport, in the middle of that surprise hail-storm Saturday afternoon, an enormous lightning-bolt that crackled past their plane heralded the return of these two great divas to Seattle in the grandest style! Focile made her Seattle Opera debut as Tatiana in Eugene Onegin in 2002, and in recent years has sung Iphigénie in Iphigénie en Tauride, Nedda in Pagliacci, and Violetta in La traviata for us. 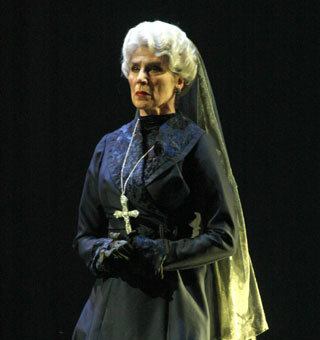 Plowright, a British singer who had an extremely distinguished career as a soprano before transitioning to mezzo soprano, first appeared in Seattle in 2008 as a memorable Klytämnestra in Elektra. She impressed us, in that production, with her ability to make a traditionally unsympathetic character real and sympathetic, and I can’t wait to see her bring this skill to bear on Angelica’s chilly Aunt. Since she now sings the mezzo role of Angelica’s aunt, Plowright is in the unusual situation of intimately knowing two roles in the same opera! The last time this situation happened at Seattle Opera was also the last time we presented an opera with everyone in the case from the same gender: the year was 2001, and the opera was Billy Budd. 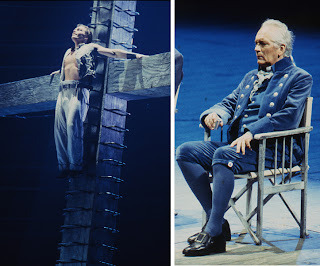 Richard Stilwell, who had sung Billy at the Met in 1978, sang the First Lieutenant, Mr. Redburn, in Seattle.